I’m torn here at BookNotes sometimes between raving and raving, going on and on, telling why a particular new book is so important, so urgent, so helpful, and the more subtle and brief approaches. This ain’t Twitter, friends, but I do know I sometimes push the limit of your generous reading time and on-line attention span. So I will try hard not to write too much today, but this book warrants it. I want to shout it from the rooftops, in great detail. This is a great, great new book! Ahh, the quandary: how to be brief when a book is so exciting to me, so urgent for the church, so perfect for our readership? I want to announce, describe, promote and sell this great new resource, and to avoid sounding like pure schlock, I’d love to take the time to explain it a bit. The publisher, Zondervan, has broken new ground, offering a devotional reader that is not a typical collection of Bible readings or devotional thoughts. 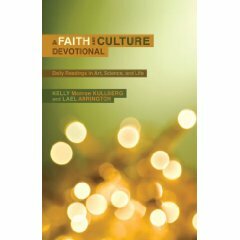 It is a reader on various aspects of Christian engagement with culture, a primer about the intellectual life well lived. Each section is arranged for 2 weeks, and each day includes a short piece—call it an essay or article or devotional, around a certain theme, followed by brief reflection/discussion questions. For instance, they offer readings in categories of history, popular arts, science, philosophy, literature, and so forth. The only thing that quite comes to mind as similar to this are the Breakpoint radio collections that were compiled from Colson’s radio show. These are a bit more broad, and not necessarily stamped with Colson’s particular perspective, making them appealing to those who enjoy that format and worldviewish framework, but who might appreciate other voices. I hope you pause for a moment and think of the value of such a reader; this is a Christian university education in a nut-shell, a refresher course (if you’re lucky) or a new batch of material you ought to know, but most likely don’t. Not only will this help you be what you are called to be, but it will be an excellent tool, a resource and reference to use often. Who knows when you’ll have to say something of worth about Picasso or string theory or archeology, literature or U2, genomes or Hamlet. You probably don’t read as widely as you should; few of us do. You may not see yourself as called to be a son or daughter of Issachar (who “understood the times and knew what God’s people should do”) but I suspect, if you are reading BookNotes, you desire to please God by being faithful, wise, active, engaged. I am sure dipping into this–in long stretches, as I might, or in the prescribed daily dose—will strengthen your mind and deepen your heart. Keep shouting from the rooftop! Your enthusiasm/call is a great encouragement to many. Great review, Byron! I’m really excited about this book too. It’s one of my favorites. Thanks for helping spread the word! Daggone this blog. It always makes me buy something. (See, in our fallenness, I Blame the Blog). I spend waaaaay too much money here, which is surely unstewardly. BTW, I’m wondering if you take direct deposit of paychecks? Bought it, reading it, blogging and twittering about it! Even bought extra copies for friends and my professor.